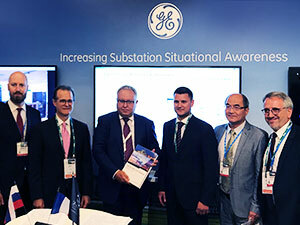 GE Power and JSC Electroapparat signed a Memorandum of Understanding (MoU) to work together on the localization of substation automation equipment in Russia. The signing took place at GE's booth during CIGRE47 on August 27, 2018 in Paris, France. The MoU provides for a possibility of joint development and distribution in the Russian market of protection relay equipment and process control systems based on both, GE's and "Electroapparat" technologies. The MoU aims to expand the product range that "Electroapparat" is currently manufacturing in St. Petersburg under the license agreement signed with GE earlier this year. Under this license agreement, Electroapparat is producing SF6 circuit breakers for 220, 330 and 500 kV based on GE's technologies for outdoor switchgears. The companies are mapping out the creation of a joint working group to be tasked with identifying the range of opportunities for short-term and long-term cooperation related to the localization of substation automation equipment in Russia. The Companies are also considering the possibility of joint R&D activities and the creation of joint centers of competence. In commenting on this MoU, Viktor Kamyshev, General Manager of GE Power's Grid Solutions business in Russia/CIS said: "This MoU builds capacity for expanding the successful cooperation between GE and JSC Electroapparat. We are confident that the implementation of the MoU will give momentum to further localization of the manufacturing of high-tech electrical equipment and components for the needs of the electric grid complex in Russia." Going forward, GE and Electroapparat will consider expanding the localization of GE's equipment with a voltage class up to 750 kV. Localization of a wide range of high-voltage products will allow a multifaceted approach to modernization and automation of Russian power facilities and industrial power supply systems, which will bring additional benefits to customers by reducing logistics costs and increasing operational efficiency. FSK UES as the largest consumer of high-voltage network equipment in Russia, is among the potential customers. FSK is implementing the import substitution program that has already led to an increase of up to 85% of the share of Russian-made primary electrical equipment in the company's purchases. There are plans to ramp up this rate to 95% by 2030 in line with the objectives of the Energy Strategy of Russia. GE widely participates in the implementation of the projects in Russia related to improving the reliability of power transmission, modernizing regional power systems and promoting a "smart grid".